Do NOT attempt to rotate arm if fracture or dislocation is suspected. Fractures and/or dislocations of the proximal humerus and scapula are demonstrated. The humeral head will be demonstrated inferior to the coracoid process with anterior dislocations, and for less common posterior dislocations, the humeral head will be demonstrated inferior to the acromion process. 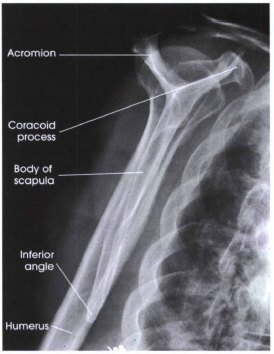 Excellent projection to demonstrate profile of coracoid process and scapular spine. Rotate into an anterior oblique position as for a lateral scapula with patient facing IR. 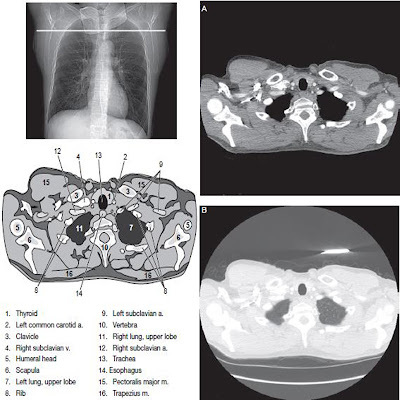 Average patient will be in 45degree to 60degree anterior oblique position. Palpate scapular borders to determine correct rotation for a true lateral position of scapula. Center scapulohumeral joint to CR and to center of IR. Abduct arm slightly if possible so as to not superimposed proximal humerus over ribs; do not attempt to rotate arm. CR perpendicular to IR, directed to scapulohumeral joint (2 or 2 1/2 inches [ 5 to 6 cm] below top of shoulder) see note. If necessary, because of patient condition, this scapular Y lateral may be taken recumbent in the opposite posterior oblique position with injured shoulder elevated. A true lateral view of the scapula, proximal humerus, and scapulohumeral joint. The thin body of the scapula should be seen on end without rib superimposition. The acromion and coracoid processes should appear as nearly symmetric upper limbs of the Y. The humeral head should appear superimposed over the base of the Y if the humerus is not dislocated. 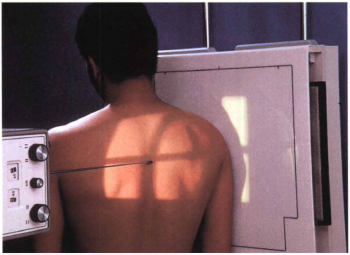 Collimation is visible on four sides to area of affected shoulder. CR and center of the collimation field should be at the humeral head and surgical neck region. Optimal density and contrast with no motion will visualize sharp bony borders and the outline of the body of the scapula throught the proximal humerus.